After a third night of protest and aggressive policing, the eyes of the country are on Charlotte. We are calling for an end to violence, not an escalation of it, in our cries to end the killing of Black people. “We continue to show up day in and day out in support of our family ­­ those who are the first and most affected. There is no right way to protest or to respond to grief or institutional racism,” said Tamika Lewis, a local organizer working with Charlotte Uprising. The uprising in Charlotte is a direct response to sustained police and vigilante violence against Black people in this city and across the country: Keith Lamont Scott, Jonathan Ferrell, Aiyana Stanley, Jones, Tyre King, Korryn Gaines, Janisha Fonville, Terence Crutcher and so many more. These are names of victims we know and deeply mourn, understanding there are so many other people who have been unnecessarily taken from us. There is an uprising in Charlotte because our bodies are used as daily target practice by police, our rage is mischaracterized, and our city officials and policymakers fail to act with integrity. Meanwhile local law enforcement ­­ who receive millions of dollars in funding each year and are equipped with military weaponry ­­ treat our streets like warzones. the very people who are protesting police shootings. Black people are dying at alarming numbers and we live in a country that wages war against us. Protestors are criminalized as violent agitators, yet police show up in our communities armed and militarized, under the guise of being peacekeepers. It’s evident that the city of Charlotte and Charlotte Mecklenburg Police Department (CMPD) devalues, dehumanizes and destroys Black lives through its policies and its practices. “The lives of Black people are infinitely more valuable than material things like windows, cars or property. Police in this city are more concerned with prosecuting vandalism than they are with the shooting death of another black person. The mayor and the governor of this state are spending time and countless resources protecting the business district and the city’s money­making institutions, but continue to ignore the needs and the demands of the communities they swore and were elected to serve. We will no longer stand for the routine murders of Black people by an unaccountable system of policing. 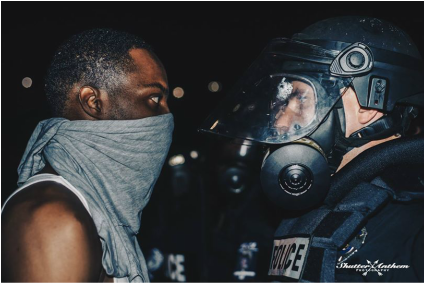 While the right to own a gun is valued as a cornerstone of American citizenship, the right of Black people to live through a police encounter is not equally valued, “said Marcus Bass, an organizer with the TRIBE and Charlotte Uprising. There’s an uprising in Charlotte because there is still so much we don’t know. Our city’s intent to cover up and edit the facts, and craft a narrative that benefits them does nothing to create trust, safety or transparency. This is why we demand our police be held accountable to the community they serve, and that they be transparent and responsible with their practices. We demand that our state and local government officials take action to preserve Black lives and support us in realizing a future where Black people in this city and the state of North Carolina receive equal treatment under the law. For more information, please contact Zakiya Scott at zakiya@teamblackbird.org.